There are many reasons why someone may not be able to keep their pet anymore and we're here to offer our help and support. Please note that we can't help pick up strays or feral (wild) cats. If you have noticed a stray or feral cat, please call the RSPCA on 0300 1234 999. What do I need to do if I want to give up my cat for rehoming? You will need to call us to make an appointment to bring your cat in. It is highly unlikely that we will have a place available immediately, due to the heavy demand for our services, but we aim to help as soon as possible. If you wish to make an appointment at the Mitcham Homing Centre please download the Admissions Enquiry Form and send the completed form to mitcham@cats.org.uk. If you accept an appointment to give up your cat, but change your mind, please let us know so that we can reassign the appointment to allow us to help another cat that needs our assistance. What details will I have to give to the centre? We will need to know the reason you want to give up your cat, together with its age, colour, gender and temperament. We will also ask if the cat is neutered, whether they are up to date with vaccinations, and whether they have been to see a vet in the last year. If your cat is already neutered, vaccinated and vet checked, this will help speed up the process of rehoming, but we cannot guarantee a space straight away. If your cat hasn't had these treatments, then they will need to stay in care with us for an average of four weeks (if we have space for them) before they can be rehomed. We are a very small centre and have very limited space - as one cat leaves our centre another immediately takes its place so please remember this when trying to give up your cat. Other animal charities may be able to help too- please go to www.catchat.org for more information. If you are receiving benefits you may be able to access low cost vet services and free neutering. Please bring the cat in a suitable carrier. If you have any spare food, litter or pet accessories you can also donate these to the centre if you wish. We also really appreciate any financial donation you can make to help us to cover the costs of looking after the cat you wish to give up, while it is our care. Caring for a new cat often costs us in excess of £300. If possible, please ask your your vet to provide a print out of your cat's recent medical history. Bringing this with you when you give up your cat will speed up the process of providing him or her with a new home. If the cat is microchipped and vaccinated please bring records of these procedures too. If you are able to write down some information about the cat's likes and dislikes in advance, we will be grateful to receive this too, to help provide potential new owners with background information on the cat. We will ask you to complete a form which will legally sign your cat over to us so that we can help find a new home for him or her. Please give as much detail about the cat as possible on this form, as this will help us to choose the most suitable adopters for the cat. For example, details about your cat's temperament, food requirements, likes or dislikes are particularly helpful for us to know. We can use this information to find a new home for the cat as quickly as possible. What happens while my cat is waiting to be rehomed? Your cat will be given a pen on their own, unless you're bringing more than one cat in which case they will share a pen. Whilst the cat is in our centre, he or she will remain in this pen, unless they are placed in temporary foster homes until they are ready to be re-homed. Our pens are safe and high quality, with heating and air conditioning. The cats will have a sleeping cabin and plenty of space to play, as well as a toilet area. Most cats settle in after a couple of days -although some do take longer, but we will do all we can to help them feel at home. If they are not already neutered, vaccinated and microchipped and treated for worms and fleas, we will ensure that they receive these treatments whilst they are in our care. Any other necessary veterinary work will also be undertaken. Our staff and volunteers spend time with the cats in our care every day. They spend time cuddling and playing with the cats, or sometimes just sitting and talking to them. As you can imagine, being in a strange environment can be very stressful for most cats, however we do all we can to minimise this and to make them feel safe. Cats in our care are fed twice a day (unless veterinary advice dictates otherwise), and their pens are also cleaned daily. 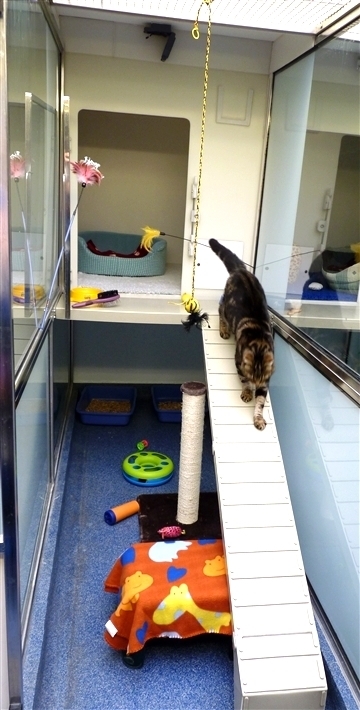 Once a cat is ready to be re-homed (after 7-14 days in our care), we'll allow potential new owners who visit the centre to go into the pen and to spend time getting to know the cat. We only show each cat to people who can provide a home that suits the cat's requirements/personality. After this initial quarantine and settling in period, the average stay for a cat at our centre is 10 days.